The SummerSlam Go-Home edition of SmackDown LIVE was filled with heated promos and intense matches that moved the WWE storyline forward toward SummerSlam. 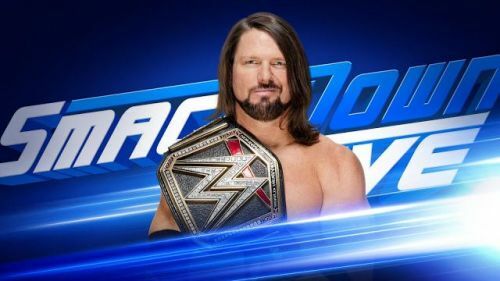 From The Miz and Daniel Bryan's 8 year long feud, to the the three women competing for the SmackDown Women's Championship, to a deeply personal letter read by Samoa Joe, SmackDown LIVE left no stone upturned. Here we break down the very best, worst, and downright ugliest moments in this week's episode of WWE SmackDown LIVE. Kofi Kingston sure knows how to celebrate his birthday. The WWE Superstar turned 37 years old today and made his way to the ring in typical flamboyant fashion. Donning a happy birthday sign, and displaying dance moves that would make James Brown envious, Kingston tossed celebratory pancakes into the audience before the South Carolina crowd gave Kingston a well deserved, "Happy Birthday" chant. As Kingston donned an ear to ear smile, it was clear he didn't know what SAnitY had in store for him. SAnitY made their way to the ring as focused as ever, and gave The New Day all they could handle in a classic six man bout. If The New Day have anything left for The Bludgeon Brothers on Sunday, it will be a miraculous feat after this barn burner. Still, the WWE Universe can't blame these six competitors for giving their all (even at the cost of SummerSlam). The two teams have better chemistry than New Day and The Bludgeon Brothers, this makes for superior matches and a great feud. While there was no "fight forever" chants, there should have been. Had this bout gone the duration of SmackDown LIVE, no one would have complained. It was that spectacular. The birthday boy (Kofi Kingston) received some unwelcome birthday beatings. He took a massive drop kick from the near 400 pound Killian Dain, was thrown to the outside of the ring in particularly brutal fashion, hit his jaw on the ring apron, and then found his body clashing with the unforgiving announcer's table outside the ring. SAnitY shouldn't be considered small by any means, but move around effortlessly performing maneuvers with ease that men half their size fail to accomplish. Dain in particular is a freak of nature, and is reminiscent of other legendary athletic giants like Vader. 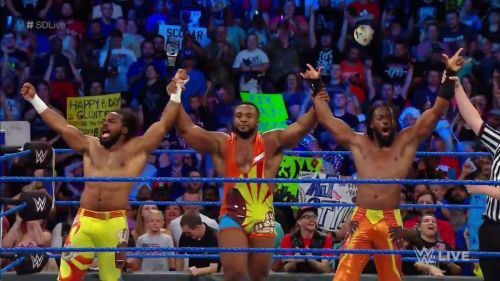 Ultimately The New Day were victorious in their efforts against SAnitY, but at the wrestling fan's great benefit, this feud is far from over.